Are you looking for upholstery cleaning Leicestershire ? Home » Are you looking for upholstery cleaning Leicestershire ? Great things sofa’s. You can sit on them, lie on them, cuddle on them, eat your dinner on them and perhaps other things. If you’ve got pets they’ll probably do most of the same. The best thing about them is that you can do all this and they demand nothing back from you. Well that may not be totally correct. You see everything you do on your sofa or chair is likely to add dirt and soiling and stains to the fabric its made of. Now upholstery fabric is often great at hiding this soiling but eventually the signs will start to show. I’ve commented in the past how you can usually see where the man of the house sits as most men seem to suffer from head grease that leaves its mark on the head cushions and I’m not sure what they do with their hands but the arms tend to be soiled from the wringing of hands from a particularly tense football match or perhaps a late night thriller. Its at this time that you should call The Rutland Cleaning Company to come and clean them and get them looking as new. Using the finest eco-friendly cleaning solutions and rinsing using only fresh water we’ll get your upholstery looking and feeling fresh but will leave no nasty chemicals behind – so that’s safe and healthy for you and your family. People are often concerned how long their sofa’s and chairs will be out of action. Using our expert knowledge of upholstery fabrics and our low moisture cleaning techniques we can ensure that if we clean your upholstery in a morning you’ll be able to watch TV in the evening sitting on them. Identify areas of concern including spots, stains, heavy soiling or issues over areas of damage or wear..
Fibre test to ensure that the correct cleaning solution and technique is employed. Placing of the upholstery onto a protective sheet to shield the flooring underneath during the cleaning process. 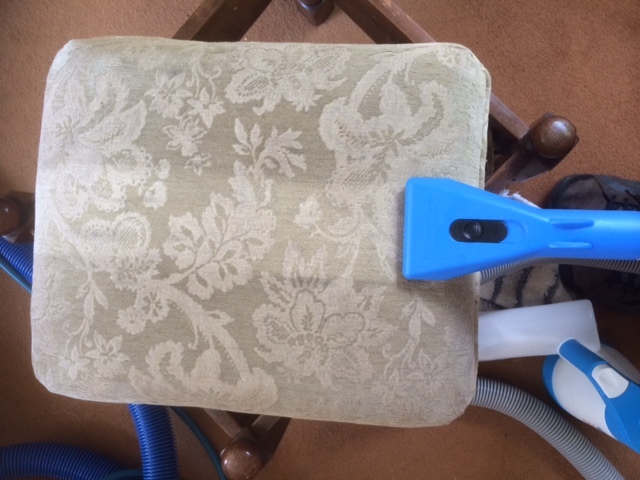 Thorough vacuum of the upholstery or curtains using our Sebo professional upright cleaner with turbo brush hand piece. 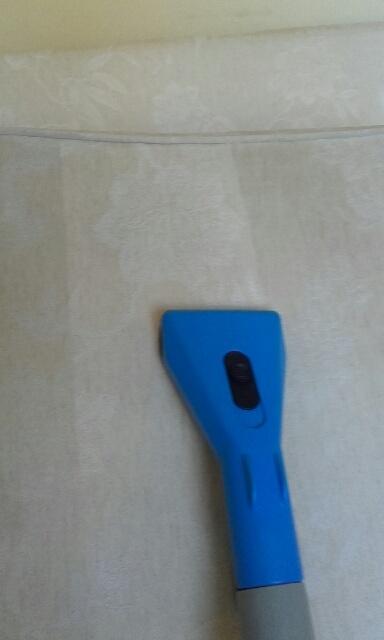 This vital step can remove up to 80% of dry soiling from soft furnishings. Dependent on the technique and cleaning solution identified at the examination stage, the solution is then applied using either a low moisture mist or very low moisture foam. Agitation. This is a vital part of the process as it ensures that the cleaning solution is distributed evenly throughout the fabric fibres to ensure a deep clean. Due to the delicate nature of upholstery fabrics this is undertaken by hand to ensure that no damage takes place, as could do if a machine were used. We the rinse out the solutions using only fresh water and extract using the powerful twin vacuums of our Jaguar 6.6 machine, the most powerful portable extraction machine available , and the Sapphire Pro low moisture handtool, to ensure that the fabric is left as dry as possible. We then assist the drying process with the use of our ‘whole room’ dryers which assist in circulating the air, noticeably speeding up the drying process, or our direct air turbo blowers, as appropriate. Finally, where appropriate with a piled fabric, we groom the pile to ensure a uniform appearance and to further aid drying.